At 12.32pm, the main 30-share index was down 1% or 182.41 points, at 17,519.35 , with 22 of its components declining. “ The fall is partly due to the uncertainty in the global markets, and partly due to the European issues, including the rise in unemployment across European countries. The market is likely to remain volatile in the short term," said Naresh Kumar Garg, chief executive officer at Sahara Mutual Fund. The country’s No. 2 lender, ICICI Bank, fell 3.14% to 901.55 rupees on profit booking, traders said. The stock had risen as much as 2.2% in the previous session after it reported a better-than-expected quarterly profit. 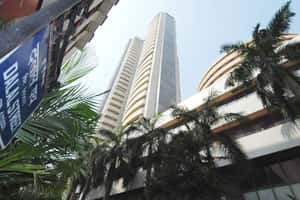 “There should be some correction in the Indian markets, which would also lead to some consolidation at present levels," said Ambareesh Baliga, chief operating officer with brokerage firm Way2Wealth. Shares in Maruti Suzuki , India’s largest carmaker, fell nearly 1% after it reported a 53% fall in October vehicle sales. The company, 54.2% owned by Japan’s Suzuki Motor Corp , ended almost two months of strikes last month, after losing production of over 80,000 cars and seeing its market share shrink to 40% from over 50% a year previously. Shares of cement makers ACC and Ambuja Cements were down 1.55% and 2.16% respectively, ahead of their quarterly earnings. A Reuters poll of brokerages had estimated ACC to post a 109% rise in net profit, and profit at Ambuja Cements is seen rising 32%. Cigarette maker ITC fell 1.7% after a report that said the federal finance ministry is exploring plans to impose additional levies on cigarettes, said two institutional dealers said. The MSCI’s broadest index of Asia Pacific shares outside Japan fell 1.76%, while Japan’s Nikkei was down 1.70%. The 50-share NSE index was down 0.95% at 5,276.95 points. In the broader market, 533 gainers were slightly ahead of 841 losers on total volume of about 271 million shares. Shares in drugmaker IPCA Laboratories Ltd were up 4.6% after CLSA upgraded it to “buy" from “outperform" on expectations of improvement in domestic growth and attractive valuations. Non-ferrous metals producer Sterlite Industries fell 3.2% after copper prices fell on the London Metal Exchange. Sun Pharmaceutical Industries Ltd rose over 2% in early trades after the drugmaker on Monday said it has received U.S regulatory approval to market a generic version of Cardizem, a branded drug for treatment of hypertension.